The fourth quarter was a rough one for most investors, as fears of a rising interest rate environment in the U.S, a trade war with China, and a more or less stagnant Europe, weighed heavily on the minds of investors. Both the S&P 500 and Russell 2000 sank as a result, with the Russell 2000, which is composed of smaller companies, being hit especially hard. This was primarily due to hedge funds, which are big supporters of small-cap stocks, pulling some of their capital out of the volatile markets during this time. Let’s look at how this market volatility affected the sentiment of hedge funds towards Agnico Eagle Mines Limited (NYSE:AEM), and what that likely means for the prospects of the company and its stock. Agnico Eagle Mines Limited (NYSE:AEM) investors should be aware of an increase in activity from the world’s largest hedge funds lately. AEM was in 25 hedge funds’ portfolios at the end of December. 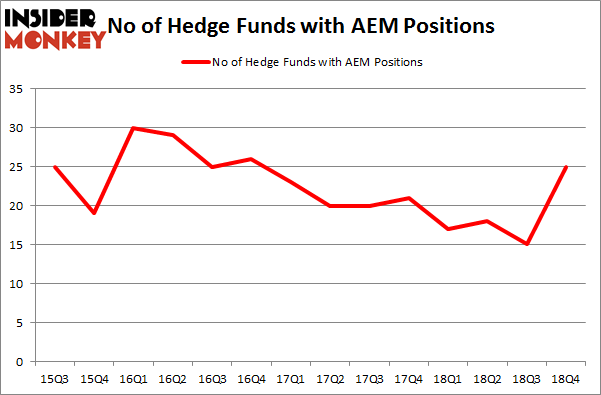 There were 15 hedge funds in our database with AEM holdings at the end of the previous quarter. Our calculations also showed that AEM isn’t among the 30 most popular stocks among hedge funds. In today’s marketplace there are a multitude of gauges market participants use to assess stocks. A couple of the most under-the-radar gauges are hedge fund and insider trading signals. Our researchers have shown that, historically, those who follow the best picks of the top money managers can beat the S&P 500 by a superb margin (see the details here). Let’s view the new hedge fund action encompassing Agnico Eagle Mines Limited (NYSE:AEM). Heading into the first quarter of 2019, a total of 25 of the hedge funds tracked by Insider Monkey were bullish on this stock, a change of 67% from one quarter earlier. By comparison, 17 hedge funds held shares or bullish call options in AEM a year ago. With the smart money’s positions undergoing their usual ebb and flow, there exists a few noteworthy hedge fund managers who were increasing their stakes meaningfully (or already accumulated large positions). Among these funds, Renaissance Technologies held the most valuable stake in Agnico Eagle Mines Limited (NYSE:AEM), which was worth $78.3 million at the end of the third quarter. On the second spot was Polar Capital which amassed $32.6 million worth of shares. Moreover, AQR Capital Management, Paulson & Co, and Citadel Investment Group were also bullish on Agnico Eagle Mines Limited (NYSE:AEM), allocating a large percentage of their portfolios to this stock. Now, some big names have jumped into Agnico Eagle Mines Limited (NYSE:AEM) headfirst. Polar Capital, managed by Brian Ashford-Russell and Tim Woolley, created the biggest position in Agnico Eagle Mines Limited (NYSE:AEM). Polar Capital had $32.6 million invested in the company at the end of the quarter. Jasjit Rekhi’s Sanoor Capital also initiated a $14 million position during the quarter. The other funds with new positions in the stock are Robert B. Gillam’s McKinley Capital Management, Israel Englander’s Millennium Management, and Peter Rathjens, Bruce Clarke and John Campbell’s Arrowstreet Capital. 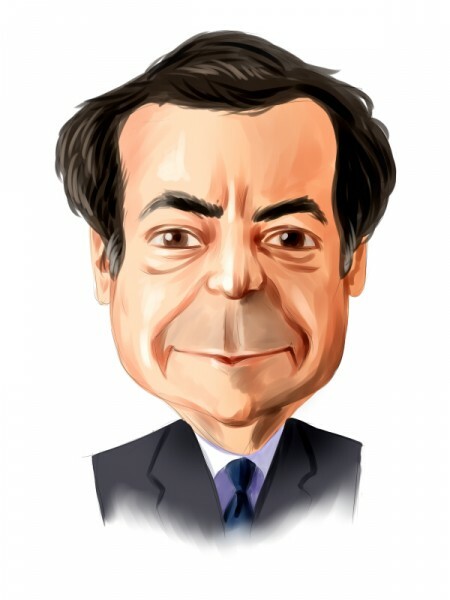 Let’s now review hedge fund activity in other stocks – not necessarily in the same industry as Agnico Eagle Mines Limited (NYSE:AEM) but similarly valued. These stocks are Woori Bank (NYSE:WF), NiSource Inc. (NYSE:NI), AEGON N.V. (NYSE:AEG), and Ally Financial Inc (NYSE:ALLY). This group of stocks’ market valuations are closest to AEM’s market valuation. As you can see these stocks had an average of 16.25 hedge funds with bullish positions and the average amount invested in these stocks was $633 million. That figure was $271 million in AEM’s case. Ally Financial Inc (NYSE:ALLY) is the most popular stock in this table. On the other hand Woori Bank (NYSE:WF) is the least popular one with only 2 bullish hedge fund positions. Agnico Eagle Mines Limited (NYSE:AEM) is not the most popular stock in this group but hedge fund interest is still above average. This is a slightly positive signal but we’d rather spend our time researching stocks that hedge funds are piling on. Our calculations showed that top 15 most popular stocks among hedge funds returned 19.7% through March 15th and outperformed the S&P 500 ETF (SPY) by 6.6 percentage points. Unfortunately AEM wasn’t in this group. Hedge funds that bet on AEM were disappointed as the stock returned 8.5% and underperformed the market. If you are interested in investing in large cap stocks, you should check out the top 15 hedge fund stocks as 13 of these outperformed the market.